Marija Skaricic as Ana in "Fraulein." Marija Skaricic at the premiere of "Shahada" during the 60th Berlin International Film Festival. 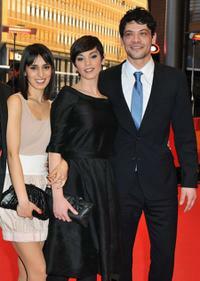 Marija Skaricic, Jeremias Acheampong and Maryam Zaree at the premiere of "Shahada" during the 60th Berlin International Film Festival. Jeremias Acheampong, Marija Skaricic and Carlo Ljubek at the premiere of "Shahada" during the 60th Berlin International Film Festival. Marija Skaricic and Jeremias Acheampong at the premiere of "Shahada" during the 60th Berlin International Film Festival.